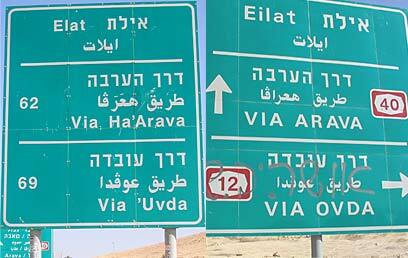 Transportation Minister Yisrael Katz recently ordered a change in roadside signs across Israel's highways so that the all names appearing on them in English and Arabic would be a direct transliteration of Hebrew. For example, the sign directing drivers to Jerusalem would read Yerushalayim, Nazareth will become Natsrat and Caesarea will become Kesariya. Arab names are to be changed accordingly. The Transportation Ministry has been working on the project for over a year and says its main purpose is to create uniform roadside spelling for more than 2,000 names of cities, towns and villages. Current road signs, says the ministry, reflect the vast changes and development in Israel's highways, and as such there are many variations of places' names. Caesarea, for instance, appears as Caesarea, Qesarya, Qesariyya and Ceysaria. "The lack of uniform spelling on signs has been a problem for those speaking foreign languages, citizens and tourists alike," explains Yeshaayahu Ronen, head of the ministry's Transportation Planning Department. "It impairs drivers' ability to find their way and we have decided to follow many other countries around the world and make the transliteration of all names correspond directly with Hebrew." Katz authorized Ronen's department to decide which signs would be replaced. "Almost all Israeli communities' names have previous names. Some Palestinian maps still refer to the Israeli cities by their pre-1948 names, since they see them as settlements," said Katz. "I will not allow that on our signs. This government, and certainly this minister, will not allow anyone to turn Jewish Jerusalem to Palestinian al-Quds." Katz is convinced the new style will not infringe on Arab drivers' ability to find their way. "We will continue to serve the Arab public and have signs in Arabic. I have no problem with an Area B (defined by the Oslo Accords as areas under the Palestinian Authority's civil control and Israel's security control) sign reading 'Nablus' in Arabic. "The names on the signs should reflect the reality of the local population, which is exactly why Israeli signs must have Hebrew transliteration." As for the cost of the new plan, the Transportation Ministry said the change will be gradual. Ministry Spokesman Avner Ovadia says that no existing sign will be changed and that the new ordinance will only affect new signs, or those replaced due to wear. Arab Knesset members were infuriated by the proposal: "Al-Quds will remain al-Quds and Shfaram will remain Shefa-'Amr," said MK Ahmad Tibi (United Arab List-Ta'al). "Minister Katz is mistaken if he thinks that changing a few words can erase the existence of the Arab people or their connection to Israel. This is a blatant attempt at harming the Arabic language and everything it represents." Hadash Chairman Mohammad Barakeh added that the decision was too far-reaching: "Yisrael Katz is merely the transportation minister and it appears that the power went to his head… I hereby inform him that he cannot change the nature of a place. Yisrael Katz will come and go but Shefa-'Amr is here to stay." Minister of Minority Affairs Avishay Braverman criticized the decision as well: "Road signs are not a political issue. Arabic is an official language in the State of Israel," he said. "I would suggest the Minister Katz place much needed street signs in Arab communities before he changes road signs." "Minister Katz has deiced to set a uniform standard to the 2,500 names appearing on Israel's roadside signs. According to that decision, communities' names would be spelled according to their official Israeli names," said Barak Sari, Katz's communications advisor. "(The names of) Jewish communities, and Jerusalem first and foremost, would be written in their Hebrew names in Hebrew, English and Arabic; just as Arab communities' names, like Umm al-Fahm for example, would be written in their Arab name in all three languages. The criticism aimed at the decision, added his statement, "Represents a fringe minority which is willing to accept attempts by anti-Israeli and anti-Zionist elements to annul Israel's identity as a Jewish and democratic state. "Anyone willing to refer to Jerusalem as al-Quds on official State signs is collaborating with the Palestinian propaganda which does not recognize post-1948 Jewish communities and still demands they be called by their Arab names." See all talkbacks "Transportation Ministry to Hebraize road signs "